When the lord of second house is placed in third house, generally it produces good results. Because, third house is second house from the second house. As per the bhavath- bhava concept, this is a very good position. Third house represents younger brother also. His younger brother may be richer than the native. Third house is the house of perseverance, braveness and fame. The native has good results in these areas. The second lord Venus will be in Gemini. This is friendly sign for Venus. Venus makes the native’s speech very sweet and soft. It brings good fortune to the native. The native gets good happy family life. The native will be having ancestral properties. Venus aspecting the ninth house makes the native very lucky. But since Venus is a powerful maraka for this ascendant, it creates some problems during Venus dasa period. 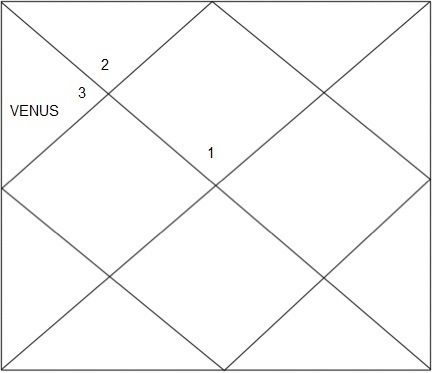 If Venus is placed in 3rd quarter of Migashirsha or 4thquarter of Ardra/Thiruvathirai nakshatra or 2nd quarter of Punarvasu/Punarpusam nakshatra then better results are expected. The second lord Mercury will be Cancer. This is enemy sign to Mercury. It brings good fortune to the native since Mercury owns the fifth house also. The native’s younger brother will be intelligent. If Mercury placed in 2ndquarter of Pushya/Psam nakshatra, it produces better results. But if placed in 4th quarter of Ashlesha/Ayilyam nakshatra, good results will be reduced. The second house lord Moon will be in Leo. This is friendly sign to Moon. So it performs moderately well in this place. The native may having female younger siblings. He may earn from abroad connections. If the moon is waxing, it makes the native famous. He may have good relationship with his mater relations. If Moon is placed in 2nd or 4th quarter of Magha nakshatra, it produces better results. But if placed in 4th quarter of Purva Phalguni/Puram nakshatra, good results will be reduced. The second house lord Sun will be in Virgo. This is neutral house to Sun. Sun and the ascendant lord Moon are friends. So it produces good results in Sun’s dasa period. The native earns though government contracts in accounts, communication, and brokerage area. The native may be having male siblings. If Sun is placed in 1st quarter of Hastha nakshatra or 1stquarter of Chitra nakshatra, it produces better results in its dasa period. The second lord Mercury will be in Libra. This is friendly sign to Mercury. Mercury is friendly to the ascendant lord Sun. so, it produces good result in its dasa period. The native earns through accounts, communication, brokerage in cine field or any art related field. If Mercury is placed in 3rd quarter of Vishaka it produces better result in its dasa period. But if placed in 4thquarter of Swathi nakshatra, then good results will be reduced. The second lord Venus will be in Scorpio. This is enemy sign to Venus. It produces moderate result in Venus dasa period. But since it aspects the ninth house and this is being its own house, brings good luck during its dasa period. Since it is an enemy sign, relationship with younger sibling is questionable. 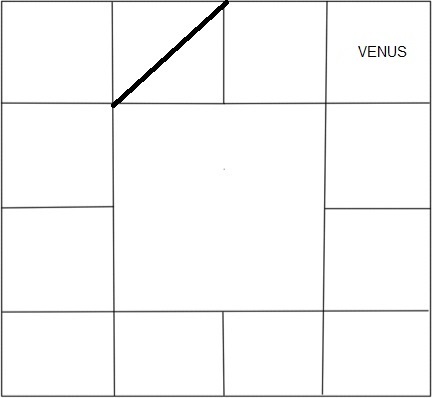 If Venus is placed in 3rd quarter of Anuradha/Anusham nakshatra or 4thquarter of Jyeshta/Kettai nakshatra, it produces better results in its dasa period. But if placed in 2nd quarter of Anuradha/Anusham nakshatra good results will be reduced. The second lord Mars will be in Sagittarius. This is friendly sign to Mars. But Mars is a powerful maraka to this ascendant, owning second and seventh house. So, it brings lots of troubles in Mars dasa to the native. Mars is the karaka for siblings. When Mars placed in third house, as per the karako bhava nasthi concept, the native may not have siblings or may not be having good relationship with them. If Mars is placed in 1st quarter of Moola nakshatra or 4th quarter of Purva Ashada/Pooradam nakshatra, better results are expected. But if placed in 4th quarter of Moola nakshatra, good results will be reduced. The second lord Jupiter will be in Capricorn. This is debilitation sign for Jupiter. This is not a favorable position for Jupiter. The native has monetary problems and troubles from children. Debilitated Jupiter aspecting the seventh house brings a good character wife but from poor back ground. If Jupiter is placed in 4thquarter of Uttara Ashada/Uththiradam 4th quarter of Sravana/Thiruvonam nakshatra, it produces better results. The second lord Saturn will be in Aquarius. This is mool trikon sign for Saturn. So it’s a good placement for Saturn. During Saturn dasa, it brings good fortune to the native. But since Saturn aspects the fifth house, it delays the child birth to the native. The native may not have ancestral properties and earns in his own efforts. If Saturn is placed in 3rd quarter of Danishta/Avittam nakshatra or 2nd / 3rd quarter of Satabhisha/Sathayam nakshatra, then better results are expected. But if placed in 1st quarter of Purva Bhadrapada/Poorattathi nakshatra, good results will be reduced. The second lord Saturn will be in Pisces. This is neutral house to Saturn. So, it performs moderately in this sign. Same as Sagittarius, since Saturn aspects the fifth house, it delays the child birth to the native. The native may not have ancestral properties and earns in his own efforts. If Saturn is placed in 3rdquarter of Uttara Bhradapada/Uththirattathi nakshatra or 2nd/3rdquarter of Revathi nakshatra, it produces better results in its dasa period. The second lord Jupiter will be in Aries. This is friendly sign to Jupiter. Since Jupiter owns the eleventh house also, it brings good fortune to the native during Jupiter dasa. Jupiter aspect on seventh house brings good charactered wife. Its aspect on ninth house makes the native lucky. If Jupiter is placed in 4th quarter of Ashwini nakshatra or 1st quarter of Kritika nakshatra, it produces better results during its dasa period. The second lord Mars will be in Taurus. This is neutral house to Mars. When Mars placed in third house, as per the karako bhava nasthi concept, the native may not have siblings or may not be having good relationship with them. Since Mars is good friend to the ascendant lord Jupiter, it brings good fortune to the native during its dasa period. If Mars is placed in 2nd quarter of Kritika nakshtra or 1st quarter of Rohini nakshatra, it brings better results to the native during its dasa period. But if placed in 4thquarter of Rohini nakshatra, good results will be reduced.